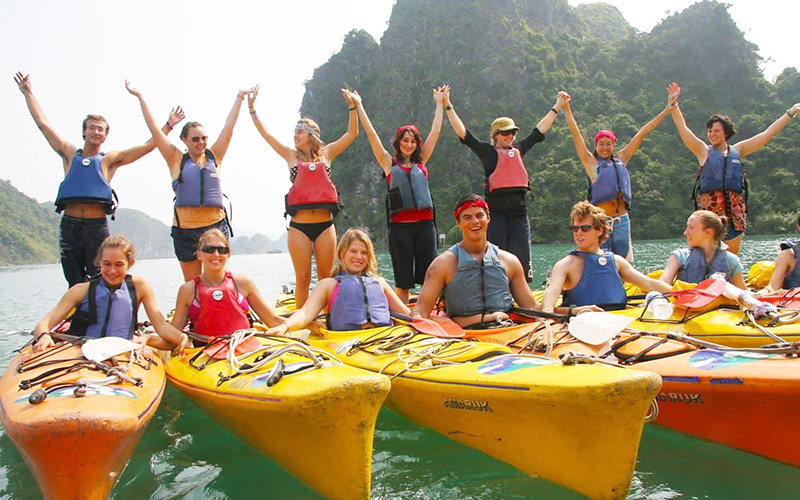 This tour showcases the kaleidoscopic beauty of northern Vietnam with a healthy dose of adventure activities such as hill tribe village trekking, bamboo boating, kayaking etc. Get ready to explore diverse regions of this gorgeous country literally from the mountains up to the bay area. 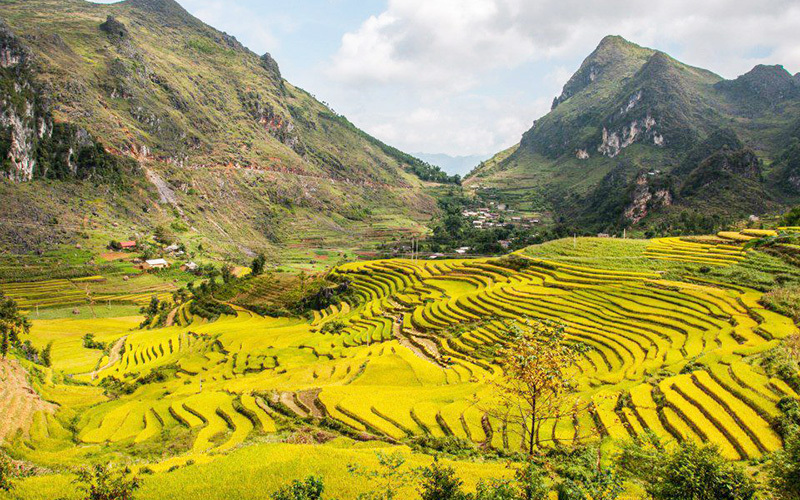 Get immersed in the thousand year old culture of Hanoi, shop in the colorful Bac Ha ethnic market and get dazzled by the Ha Giang and Dong Van rocky plateau as well as the Ba Be national park. 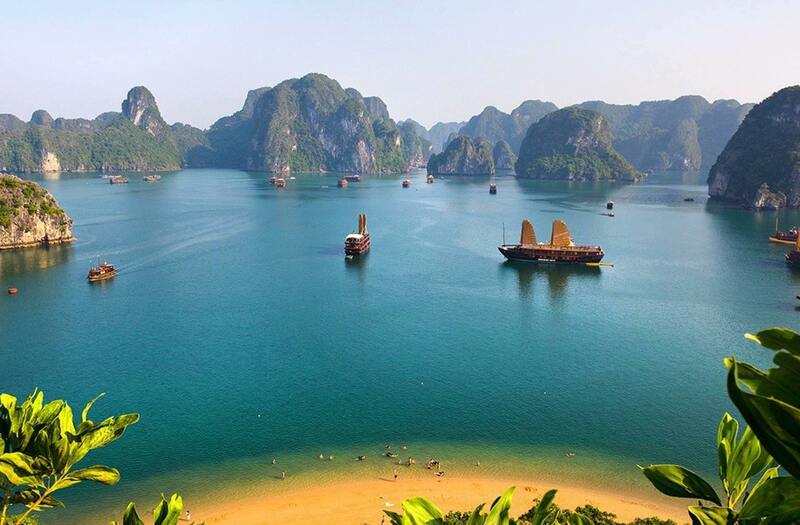 Bond with the locals at the Pac Ngoi ethnic village, relax at the biggest fresh water lake Ba Be and marvel at one of the seven natural wonders of the world Halong Bay, this trip will leave even the most seasoned traveler awestruck. At 5 a.m, arrive at Lao Cai. Take a shower to refresh yourself at a mini hotel before travelling to Bac Ha, a small charming town characterized by its mild climate. 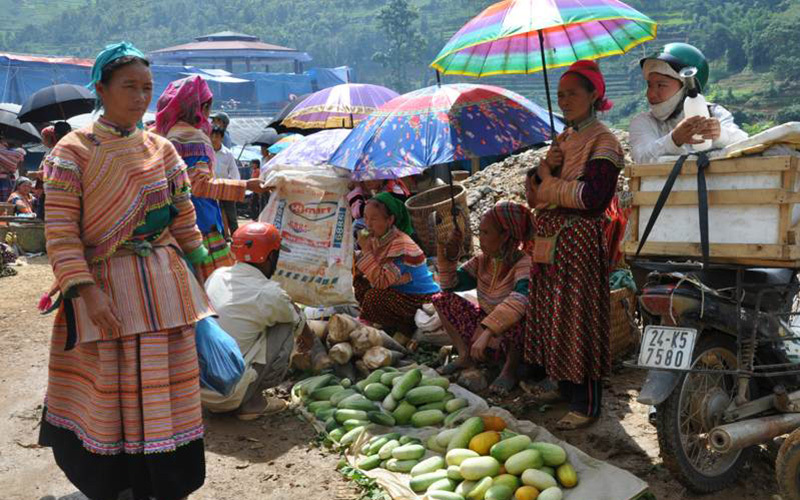 Depending on the date of arrival, visit Bac Ha market on Sunday, Can Cau market on Saturday or Sin Cheng market on Wednesday. The markets feature local scenes that have been going on every week for generations, where cattle, buffalos, pigs, chickens, horses, goats and dogs as well as a variety of traditional goods like saddles and plowshares, along with elaborate textiles, handbags and other trinkets are bought and sold by the Flower Hmong. 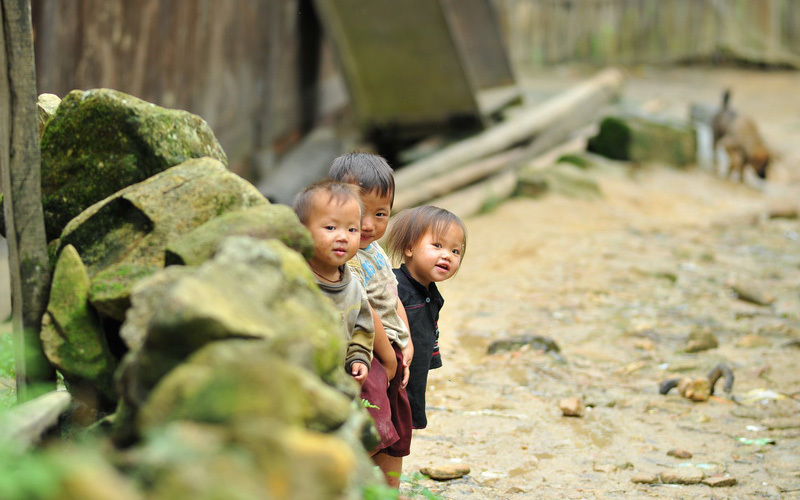 In the afternoon, enjoy a trek through Ban Pho villages, located a few kilometers from the hotel. 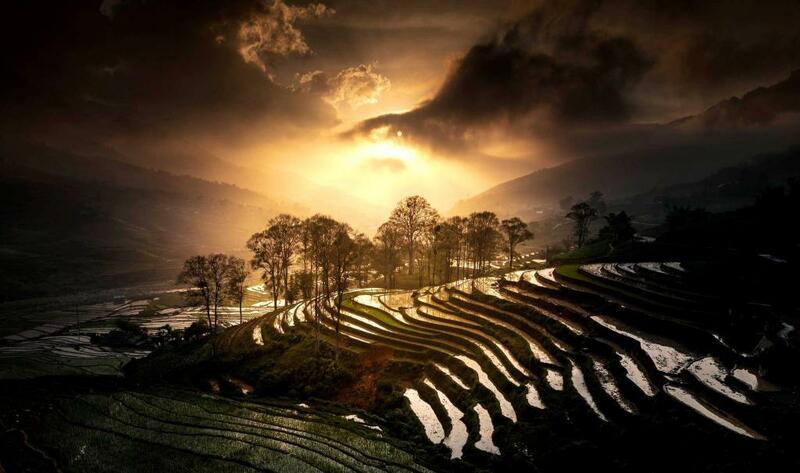 These villages are nestled into a cozy valley with a fascinating landscape. Spend the night in the homestay of Mr Pa.
After breakfast, transfer to Ha Giang via Pho Rang, Viet Quang town. 20 km before Viet Quang, take 2 hour walk to a village of Pa Then people, a very rare ethnic minority in Vietnam. The Pa Then, also called Pa Ma Teng, migrated to Vietnam from China in the late 18th century. 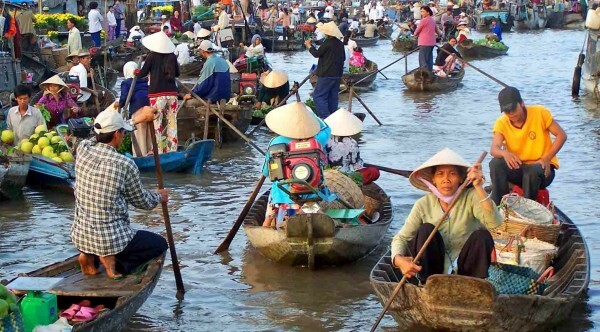 Their population in Vietnam is about 4,000 people, living only in the extreme north. Their village, composed between 30 and 40 homes, settled near rivers, at the foot of high mountains. 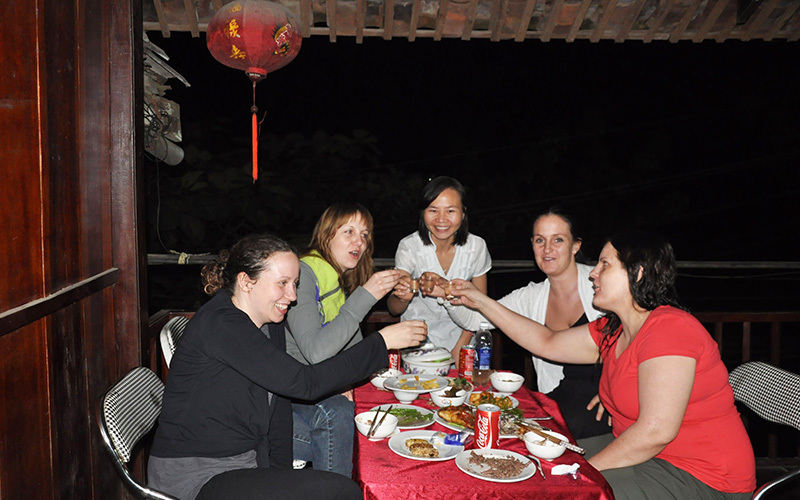 Arrive late afternoon in Ha Giang, check in hotel and relax at your leisure. Spend the night at hotel in Ha Giang. After breakfast, hike one hour along a path that descents to the road connecting the Middle Song Mien valley to the Du Gia mountain range. Walk on the trail along Nam Pa river to reach a Tay hamlet, little eden surrounded by rice fields and jungle. Take a visit around the village. Move to another Tay village which is located in the shade of groves of palmetto, dominated by limestone ridges covered with jungle. Enjoy a picnic lunch in a traditional Tay house. After breakfast, travel along a beautiful mountain road to Dong Van, a small town located in Dong Van Highlands. 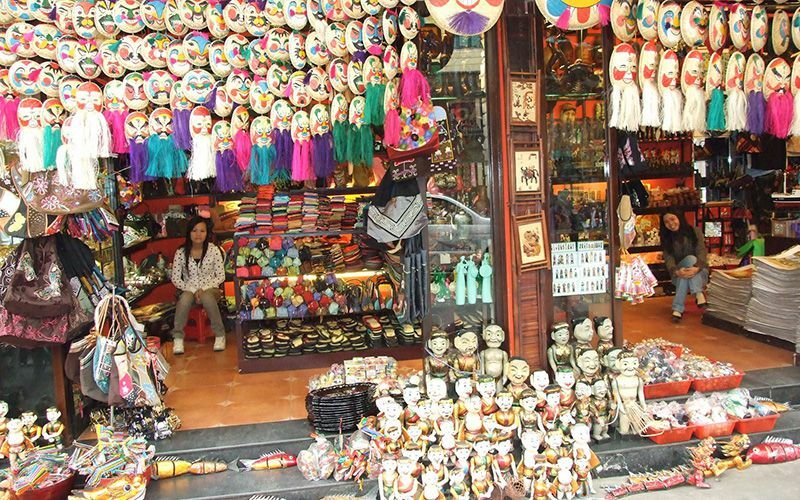 Tourists can choose to stop midway to visit villages or markets of ethnic minorities. Drive 1 hour from Dong Van through the sumptuous countryside of Dong Van Geopark. From here, begin a trek on Pa Vi Mountain. Pa Vi Mountain is a limestone mountain rising to 1,500m. The north face of the mountain roughly resembles a triangular tower with spectacular views overlooking the gorge of the Nho Que River, Tu San Canyon, the famous Ma Pi Leng Pass, and the misty peaks of the Chinese border. 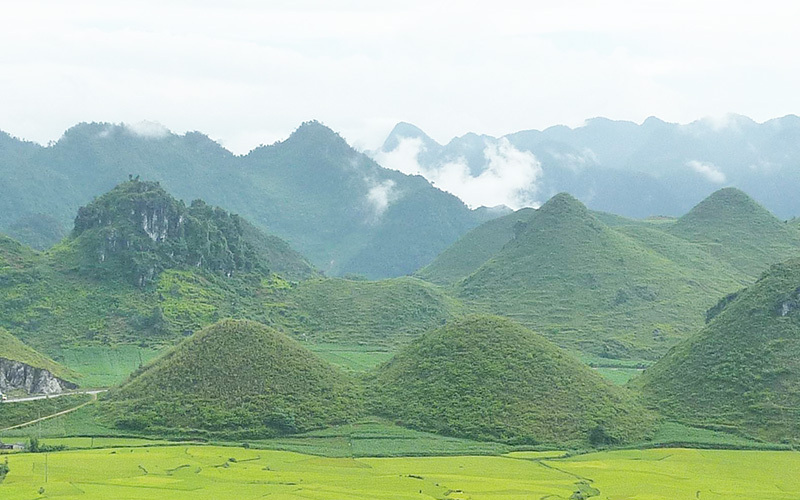 The mountain’s unusual shape is unique among Vietnam’s mountains and makes it a sight to behold. Hike along the slopes of Pa Vi. Cross at Ma Pi Len and begin the day’s trek (30 minute trip). Climb the west side of the mountain on a path past several Hmong hamlets clinging to the steep slopes of the mountain. Revel in the alpine environment and the amazing bird-eye views of the terraced rice fields below, as well as Tu San Canyon, Ma Pi Leng Pass, and the No Que River gorge. Gaze at the awe-inspiring mountains all around. Arrive at the Hmong Der village of Ti Cu Si, where around 100 families live in a completely self-sufficient community. The village is hidden in a small valley surrounded by a plethora of limestone peaks. Tour the village and its traditional houses and learn about local hemp weaving techniques. Continue trekking along a high trail towards the east side of Pa Vi, where the minibus awaits. 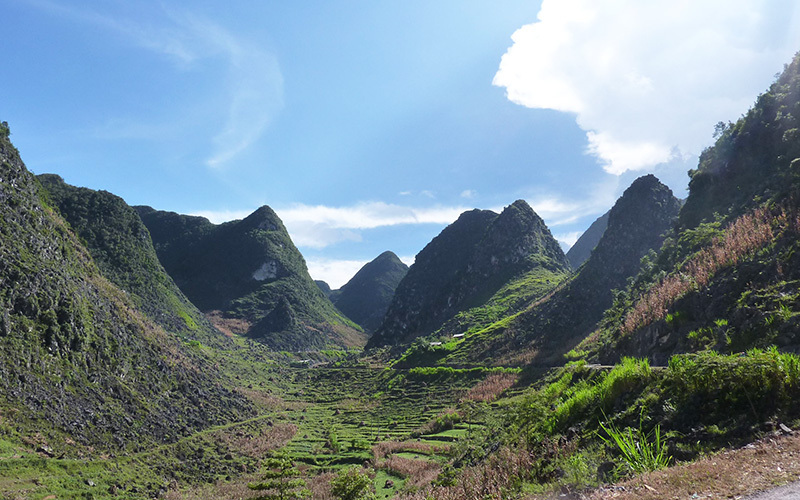 Continue the trip to Bao Lac, a region covered with magnificent rocks in Cao Bang Province. Spend the night in Bao Lac. Arrive at the village and check in the host family. Spend the morning immersed in the daily life of the Black Lo Lo villagers. Participate in tasks such as feeding the pigs and the buffalos, fetching water from a spring, and lighting the fire. Depending on the season, enjoy the educational experience of helping the Lo Lo with agricultural work such as hoeing, weeding, transplanting, and harvesting. In the afternoon, take a lovely hike along the ridge to the summit overlooking the village. Prepare dinner with the host family. Spend the night in homestay. After breakfast, drive to Ba Be Lake, passing through Ban Na and Na Phac villages. On the way stop to visit an ancient house, one of the remaining vestiges of the colonial era. 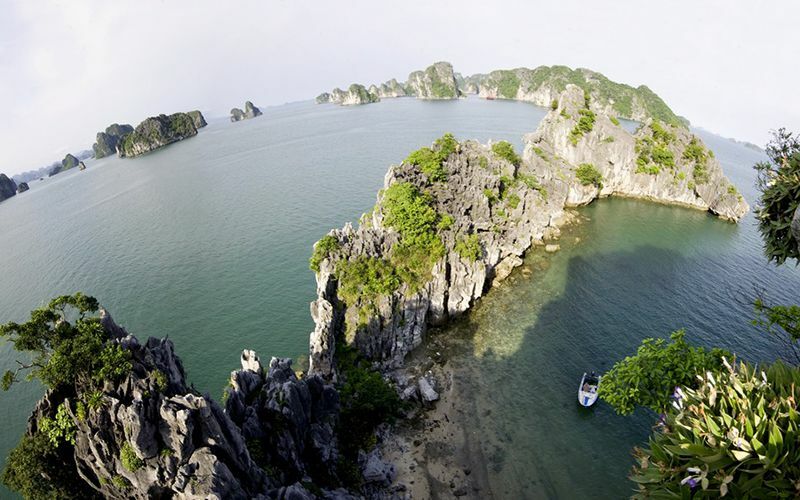 In the afternoon, arrive in Ba Be Lake, a region often referred to as “Ha Long Bay on the mountains”. The lake is decorated by green mountains under the clouds, giving tourists the impression of having been transported to heaven. 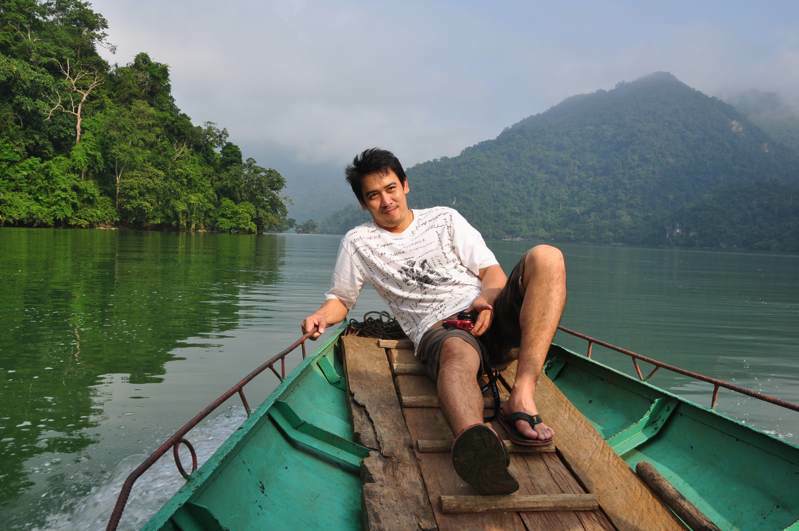 Board a boat along the beautiful lake to Coc Toc, a Tay hamlet nestled at the foot of a wooded mountain on the southern arm of the lake. Tour the village, and then help prepare a traditional dinner with the host family. Learn about the night fishing techniques if the weather permits. Spend the night in homestay. 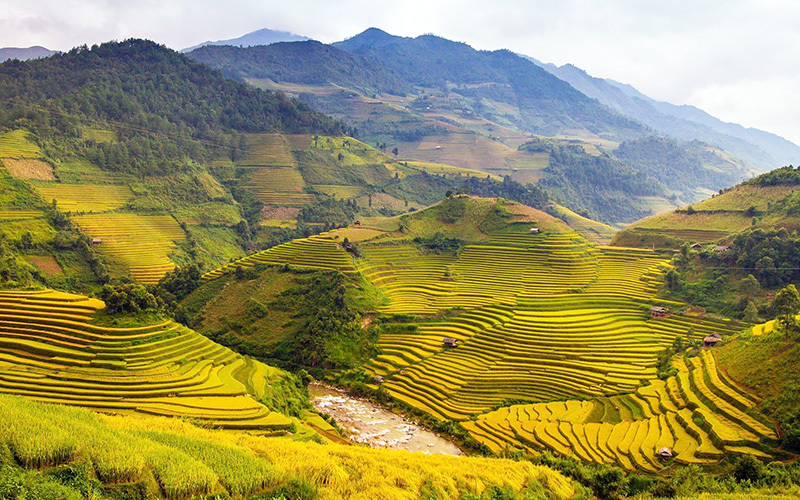 In the morning, head out of the village for a fascinating hike through the stunning landscape along a flat trail, passing through rice paddies, corn fields and vegetable gardens. After an hour, arrive at Ban Mo, a Tay hamlet situated at the bottom of the verdant valley. Tour the village and then continue along a trail that offers breathtaking lake views. Explore the Hmong village of Na Ban and the Dao village of Na Sen. After passing through an ancient and magical forest at the summit of the mountain, slowly descend towards Dau Dang cascades. From here, enjoy a delicious lunch. 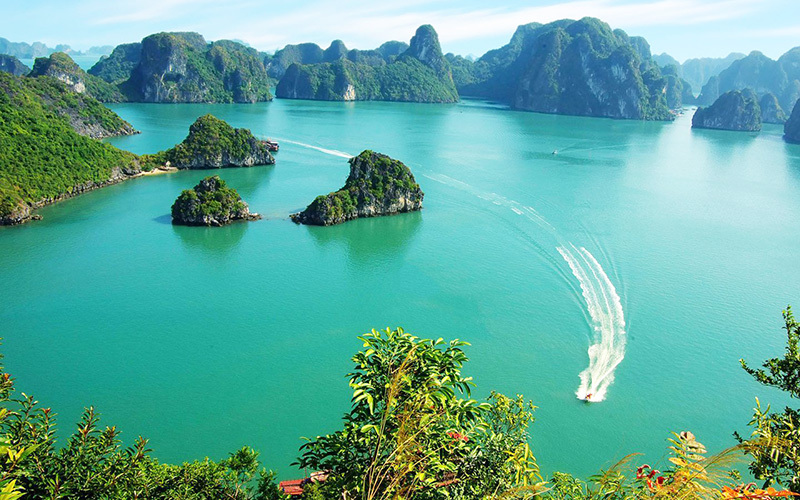 Visit Dau Dang cascade, a picturesque natural wonder. 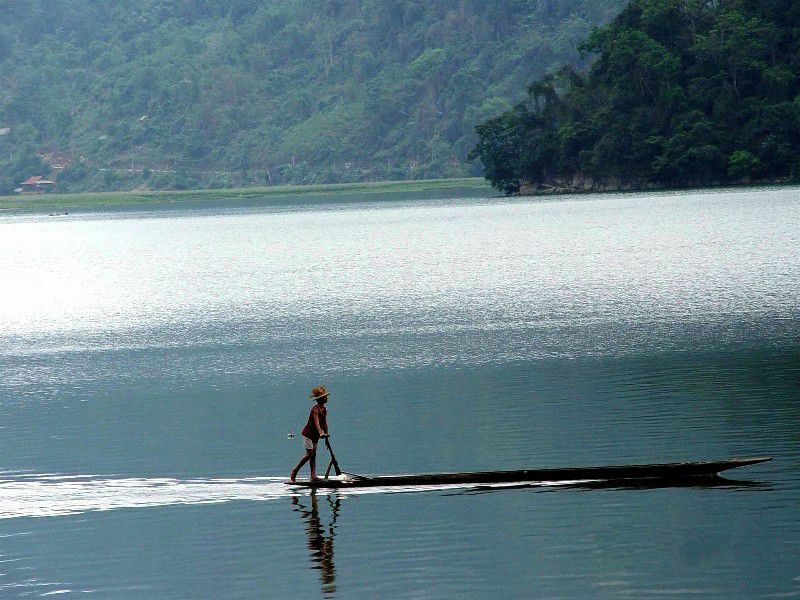 Re-embark to Coc Toc village along a tranquil lake. Dine and spend a second night with the Tay family. After breakfast, leave the Tay family and drive back to Hanoi on a stunning mountain road. Spend the night at hotel in Hanoi. 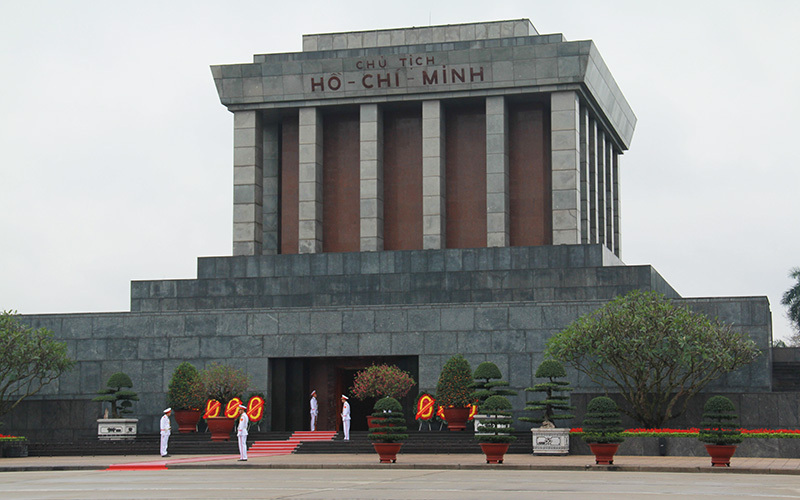 16.00: Arrive in Hanoi. The tour guide will take us airport for departure flight. End of services!